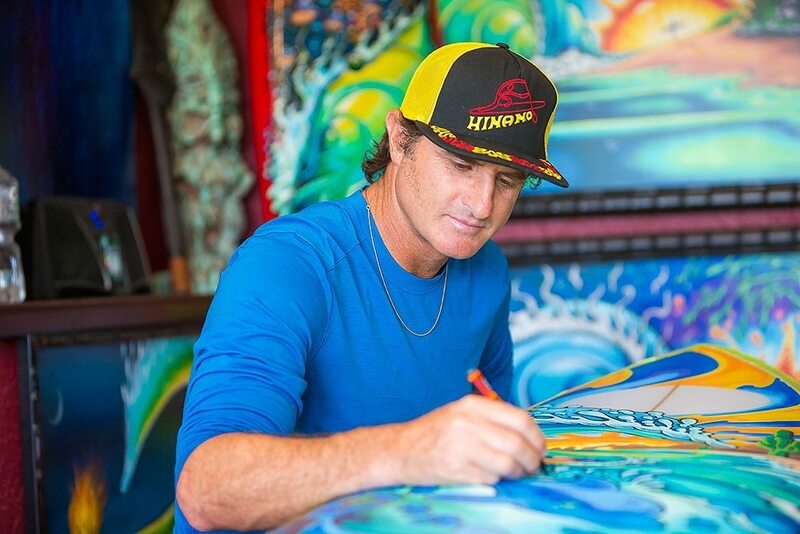 If you’ve ever searched for surf art online then you’ll be familiar with Drew Brophy’s work. He paints scenes of gaping barrels and effervescent sunrises where tiny surfers catch the waves of their lives and enjoy bonfires on the beach. His style is characterised by bold lines and summertime colour palettes that draw the viewer into a world of energy, motion and abundant detail. We caught up with Drew to chat about how the surf lifestyle provides inspiration for his art. Hey DREW! How’s your day going? I’m having a relaxing day, not doing much. Just got back from a trip to Mammoth Lakes. Nice! had any good waves lately? There was a big swell last week; I caught some good surf at Lower Trestles with a hundred of my best friends. It was awesome! Your art is completely unique. What inspires you to create? The ocean, waves and adventures with my family. I like going to new places, surfing new spots, getting into nature. It fuels my art. And what are the perfect conditions for creativity? I live a life full of adventure and excitement most of the time, and then when it all slows down, it just comes out. It’s a part of my experience. Who are your favourite artists both in the surfing world and beyond? I am influenced by Salvador Dali, Picasso and Alex Grey. In the surfing world I admire Rick Griffin, Bill Ogden and Chris Lundy. So What are the challenges in a career as a surf artist? It sounds like a dream, but it’s still a job. You have to perform and get things done. Every morning I wake up and say “how am I going to make money today?” I’m constantly figuring things out. I love that a lot of my job is going on surf adventures. That’s the best part. If I didn’t travel and surf, it wouldn’t be real. There are artists out there who call themselves “surf artists” but all they do is copy photographs. They don’t actually surf. When I’m surfing, I capture the vibe of the experience, and somehow it comes out into my paintings. Your paintings are super vibrant. What are your favourite mediums and is there anything you’d like to experiment with in future? I’m known for changing the way that surfboards were painted by using my Paint Pen techniques (back in the 1990’s). I always tell myself that I’m going to learn how to get good at using traditional mediums like oils. But, I’m always mixing it up. I like using spray paints and paint pens and whatever gets the job done. Surfing saved my life. I can’t imagine life without it, I probably would have been dead long ago. Any words of wisdom for people dreaming of becoming a surf artist? There are a lot of lessons to be learned in surfing. No matter if the waves are big or small, it’s about going with the flow and riding the energy of the earth. There’s something very simple about it. That’s the way I try to live my life. Sometimes you wipe out, and sometimes you have a great ride. No matter what, I keep paddling out. Totally get that. In fact, I wrote a book about that! So how can people buy your art and connect with you? They can go to my online store here http://store.drewbrophy.com/ or visit my main site. Awesome, well-written and inspiring piece. Thanks Bradley and Drew!